Somehow, L has been watching a lot of British cartoons on Hulu. Her favorite recently has been something called Peppa Pig. She loves that show for reasons we can’t figure out. One of the things that come up often in that show is soccer…or as they call it, football. Before she ever got in to the show, J suggested I sign L up for a soccer camp. It’s about the only sport we could find for her age group and even though I’m not a huge fan (or really a fan at all) I decided to go ahead and do it. Last Monday, we started soccer camp..which L called football for half the week through Kingdom Sports. The camp was at Mattawan Middle School and only lasted about 45 minutes. J was really excited to see L run around and play soccer with other little kids, so she made the holiday weekend a little longer and took the day off so she could go the first day. The camp ran until 11:30 so it was right about lunch time when we were packing up and heading home. J suggested we find something along the way. I knew there was a Main Street restaurant back near the Interstate and we’ve always had good luck with their other restaurants in the past. 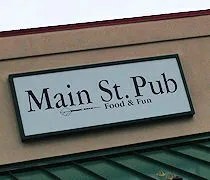 The Main Street Pub in Mattawan is in a small strip mall on Main Street just north of the I-94 interchange. It’s in the back part of the development that also houses Chin Chin Asian Bistro and NaDene’s Coffee and Bakery. There is a little room to park along the side and in front of the building, but the large parking lot in back also has an entrance in to the pub. The layout of the restaurant is pretty similar to the other Main Street properties we’ve been to. There’s a large bar area with pub tables and a row of booths then a separate dining room with more tables plus a party room that can be closed off. We found ourselves a booth in the bar area and took a seat. The menus are already on the table in the form of placemats, but a waiter saw us with a toddler and brought over her menu on a different place mat and a package of crayons for her to color with. We both started with pop. They had Pepsi products so I got a Pepsi while J ordered a Sierra Mist and a water for L.
Lunch was no surprise. I ordered the burger dubbed The Highwayman. The burgers are 8 oz. ground choice steak that is served on a toasted bakery roll. 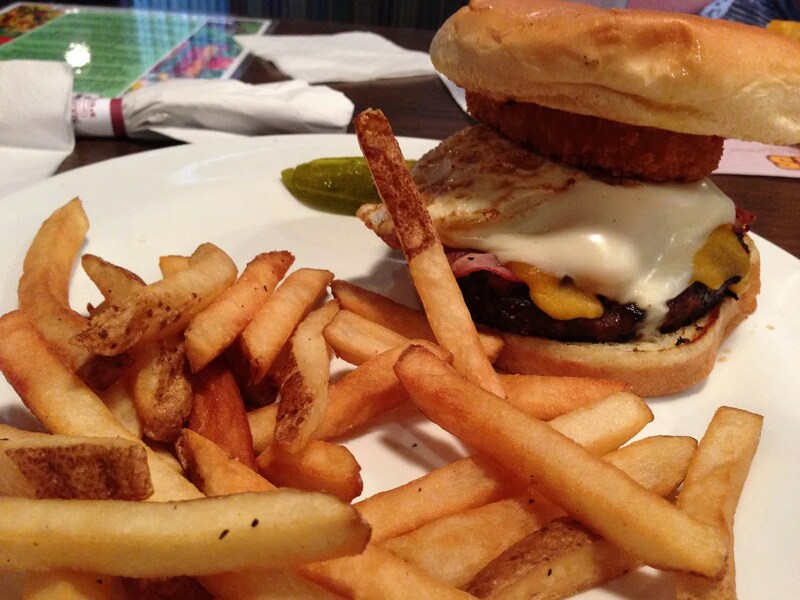 The Highwayman comes topped with cheddar cheese, ham, a fried egg, BBQ sauce and an onion ring. The burger tasted like breakfast. The meat was juicy, tender and flavorful while the ham gave it a little saltiness. There was a sweetness to counter that salty from the BBQ sauce and the fried egg was able to stand out above the burger. I took the onion ring off because I don’t like onions. J actually picked it up off my plate and took a bite. She said it was good, but she’s not an onion fan either. She did, however, really like the breading, so she pulled the onion out and enjoyed the deep fried goodness. The sandwich came with a handful of skin on fries. There weren’t a lot of them on the plate, but it wasn’t needed with the size of the burger. The fries were crispy and salty and yummy. J’s order was the Hawaiian Pork Wrap. 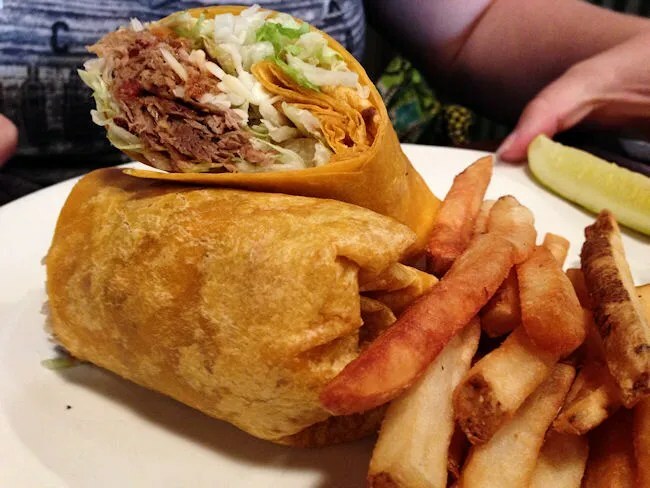 The jalapeño cheddar wrap is filled with a large portion of pulled pork, a home made BBQ sauce, grilled pineapple, lettuce, and mozzarella cheese. I was most surprised with how much meat was in the wrap. There was still more lettuce than meat, but it wasn’t all lettuce. J was able to eat about half and took the rest home for breakfast. She didn’t really say much other than it was good. Her wrap also came with fries which seemed a little sparse, but may just be due to the size of the plate. 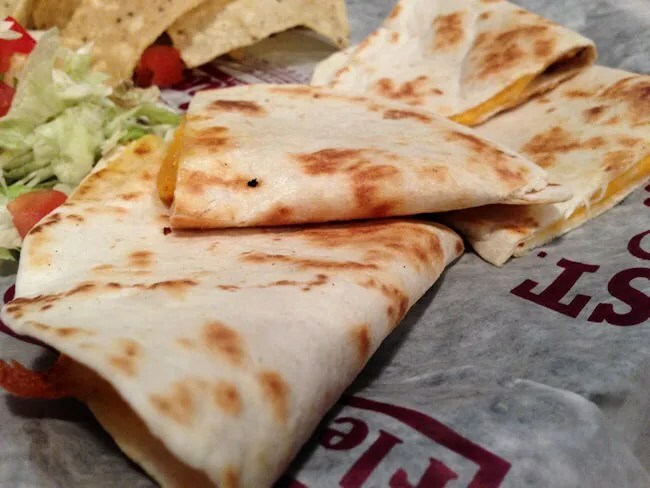 L will almost eat a quesadilla when we order one for her so that’s what we did. The great thing about Main Street is that kids eat free on during the week and we were there on a Monday…oh, and they get a sundae with their meal. L ate about half of her cheese quesadilla and a few of her fries before devouring her sundae (with some help from Momma). Our bill was around $23 after the price of L’s meal was taken off due to kids eating free on that day. Main Street has a solid string of restaurants around the area and we’ve never been disappointed at one. 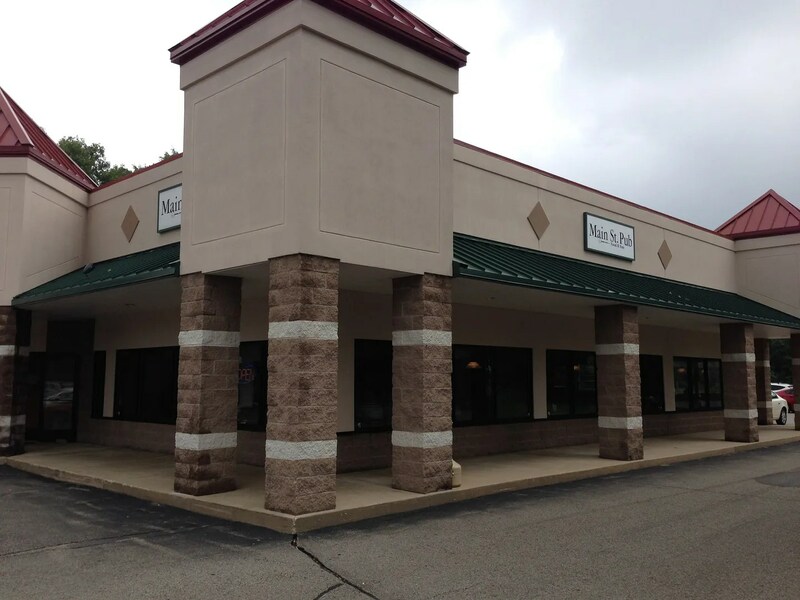 The Mattawan location was no exception. We had another solid meal and were able to get home quickly to enjoy the rest of our afternoon together.